What's special about Jobeky Electronic Drums? A common theme for Jobeky, that some of you will know well, is that we don’t compromise. Not with our products, our technologies, not our endorsees, and most of all not with you – our customers. and put our feet up quite yet. We are continuing to innovate and push the boundary of electronic drums into uncharted territory. That said, Jobeky isn’t just about building drums. Running annual Jobeky Custom Drum Shows and the development of this new website are some of many things we are doing right now, in response to your requests – but what more should we be doing? Come and tell us! We welcome your feedback, as always! Colin’s adventures in drumming started at the early age of 4 when he was presented with his very first drum kit. The love affair between all things drumming and Colin developed strongly from that point onwards. In his late teens Colin played for several bands in the Staffordshire area, and was strongly influenced by the new wave drumming sounds emerging from pioneers using early Simmons electric pads and systems. During this period, Colin could have really benefited from owning an electric kit, however like many of today’s drummers he quickly became used to the logistical difficulties of trying to keep up drumming practice in a home and school environment. In the late 80’s Colin started to experiment with building his own drums and soon discovered that trying to make drums was nearly as much fun as playing them! In 1989, Colin reached a major milestone in his life – he was forced to sell his beloved special edition Premier kit. However, the year ended on high as he also met his future wife Jane and they’ve since been together more than 20 years. Colin’s adventures in drumming continued however. In 1995, Colin released ‘The Art of Drum Making’ through his own enterprise, ‘Drumwise Publications’. This was a complete guide to self construction of drum shells and formers. It utilised a technique so well developed that it later became the bedrock technique for drum manufacture for a number of acoustic drum-building companies, one of which is still in operation today. In 2005, Colin decided that the future of drumming was firmly headed in the direction of electronic drums, and thus Jobeky Drums, and the ‘Jobeky Classic’ electric kit (his first production kit) was born. 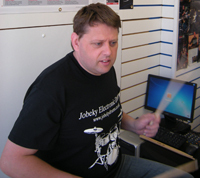 Colin’s expertise and vast knowledge of drums continues to this day, and Jobeky Drums is firmly positioned within the electronic drum market. Jobeky Drums offer mature technologies and a truly innovative product line merging the best of the acoustic world with the best of the electronic world. 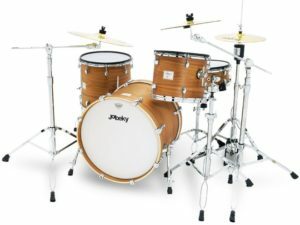 Drums that look, sound and feel just like real acoustic drums – but with controllable noise levels!